Q From Richard Levy: I have heard that the expression bitter end originated in nautical references to the end of mooring ropes that are attached to bitts, that is the posts on jetties and quaysides. Is this correct? A Up to a point. By which I mean that it’s almost universally given as the origin, so to try to deny it may seem wilfully contrarian. But there’s enough evidence to cast some doubt on the matter. And the Oxford English Dictionary notes that its history is uncertain. The idiom has had two senses. To go on until the bitter end today means that a person will persevere with something until it is quite finished, no matter how unpleasant or difficult that is. However, some dictionaries add a second sense: to continue to the last and direst extremity, such as total defeat or even death. The two are obviously linked, the former being a weaker version of the latter. As you say, in nautical terminology the bitts are posts for fixing ropes to. The word is usually plural because bitts normally turn up in pairs, so that sailors can speedily wind ropes around them in a figure of eight pattern to hold them fast without having to tie knots. Alternatively, they might take a turn of a line around the bitts to control the rate at which they’re paying it out. Bitts are a standard part of shipboard equipment. 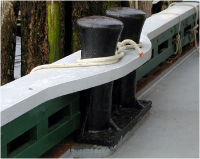 They do also turn up on quaysides, though these are often larger and singular and are called bollards. Bitt may be Scandinavian, though nobody knows for sure. Bitter goes back to the early seventeenth century. It appears first in Captain John Smith’s Seaman’s Grammar of 1627. It meant the end of a cable or rope that remained fixed on board ship when it was being paid out through the bitts. The word would seem to be bitt plus -er, as in header, rounder and cropper. It has no etymological connection with the adjective bitter for a sharp unpleasant taste, which is Old English. Admiral William Smyth explained in The Sailor’s Word-book in 1867 that “When a chain or rope is paid out to the bitter-end, no more remains to be let go.” Hence, so the argument goes, the meaning of the idiom. But there’s nothing that’s necessarily unpleasant or difficult in that process. And it’s hard to imagine its giving rise to the second sense — the ultimate and direst end. Modern works frequently say that the idiomatic meaning arose when a ship was trying to anchor but the water turned out to be deeper than expected; the whole cable would then be run out without the anchor touching ground. This was clearly potentially disastrous; however, any ship’s officer who anchored in a strange harbour without first testing the water depth by casting the lead would rightly be thought incompetent. But the story is most likely just a well-meant attempt to explain the idiom on the assumption that it must have something to do with seafaring. Glossaries in the sailing era — such as Smyth’s — define the term neutrally and generally, with no mention either of anchor cables or emergencies. For the lips of a strange woman drop as an honeycomb, and her mouth is smoother than oil: But her end is bitter as wormwood, sharp as a two-edged sword. Her feet go down to death; her steps take hold on hell. Proverbs 5:3-5, from the King James Bible, 1611. And will the pois’nous dust-fed serpent send. The Second Song of Moses, in Juvenilia, by George Withers, 1622. This is a translation of the Hebrew of another Biblical verse, Deuteronomy 32:24, which the King James Bible renders as bitter destruction instead of bitter end. And, thro’ my lips, receiv’d her latest sigh. An anonymous song, in the Gentleman’s Magazine, Feb. 1744. Latest here means last. Many other examples of bitter end occur in the eighteenth and early nineteenth centuries, well before the first example cited in the Oxford English Dictionary, which is from the USA in 1849. Many of these are in religious tracts or sermons, which suggests it was indeed Biblical in origin. As an intriguing aside, bitter end appears several times in Dutch and German works of the eighteenth century as a English expression that seemed well known and may explain why it is still known in German in literal translation (Bis zum bitteren Ende). It may well be that two distinct strands developed in parallel — a literal one from the maritime world and a figurative one based on the Biblical quotation. They may well have influenced each other. We have no way of knowing. But enough evidence exists for us to be able to say that it wasn’t just a sailor’s expression, conceivably even that the figurative meaning isn’t nautical at all. Last modified: 12 September 2009.